The Cool House: Can You Hear Me Now? I hear that you respond favorably to demands from damsels in distress and provide cell phone coverage to those who ask for it, no special favors necessary. I'm therefore asking you to accord me the same service you granted to Cindy McCain, so that I can be heard (and others can hear me) in this important election year 2008. I know that you didn't grant Ms McCain any special service because Senator McCain's campaign says so: "Mrs. McCain's staff went through the Website as any member of the general public would -- no string pulling, no phone calls, no involvement of Senate staff,"(...) Just because she is married to a senator doesn't mean she forfeits her right to ask for cell service as any other Verizon customer can." I live in an Incorporated Village where the Board decided in 2005 that we did not need twenty-first century telecommunications. I don't know the reason, the minutes aren't very detailed, but in any case I am denied coverage, which puts me at a disadvantage living in a world dominated by Blackberry's and iPhones. I am out of touch, and it is affecting both my mental health and ability to do business. It also makes us look rather backward to our friends in Europe and Asia who can't believe we live in the greatest country on earthTM yet still cling to our landlines. 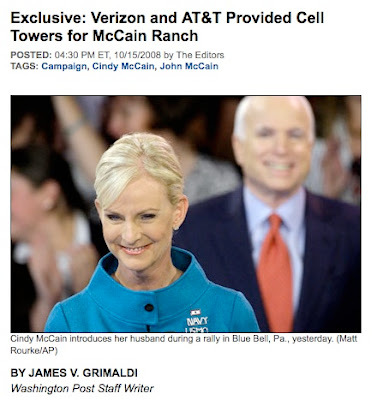 I know just how Ms McCain felt missing her text messages, and I think one of those portable cell towers or "cell site on wheels" would be a solution to all my cellphone woes. Maybe you could park it right behind the Village Hall? I know you don't like to comment on individual customers and their requests but I'm confident you will give my request the same priority you gave the McCain's and I'm looking forward to a favorable outcome and "full bars". modernemama @ The Cool House. a great post. it made me chuckle. haha, I love this post! You tell it sister!